Which dog food is best in 2017 | Check out these 5 best dog foods! Which Dog Food Is Best in 2017? If you are asking yourself which dog food is best for your dog, you are not alone. There is such a range out there that choosing a food for your pooch can be tricky. Some dog foods are better than others, however – it’s just a matter of knowing what to look out for. What makes a good-quality dog food? Meat protein as the first ingredient; and there should be at least 2 meat ingredients in the first 5 listed. No meat by-products: these are not quality sources of protein for your dog, as they are not easily digestible. Modest carbohydrate content: avoid foods that include a carbohydrate as the first ingredient. Free from wheat, corn, and soy. Taste of the Wild gets the number one spot. This brand has a whole lot of happy customers (humans and dogs alike!) and its top quality products come at a very affordable price. This formula is bursting with a range of high-quality meat sources that make it positively drool-worthy for your dog. It is also grain-free, so it’s a great food for dogs with grain allergies or sensitive tummies. The carbohydrates come from potatoes, sweet potatoes, and yucca, and there are also tomatoes, berries, and peas to give your dog a good dose of vitamins and minerals. Taste of the Wild only uses natural preservatives, and their food is steam-dried using purified water. Quite impressive, no? Orijen is an award-winning brand that focuses on producing great-quality dog foods. They include various sources of meat (organs and all! ), all of which are cage-free. Plus, many of their ingredients are fresh and local, and all of their formulas are grain-free and low in carbohydrates. Orijen Original is one of Orijen’s most popular products with customers, which is suitable for dogs of all life stages. It has a dry matter protein reading of 38%, a fat level of 18%, and carbohydrates of about 19%. In other words, it is high in protein and fat, which are quality sources of energy for your dog, and low in carbs, which your dog doesn’t need a whole lot of. What’s more, this dog food is also full of nourishing vitamins and minerals that come from a range of fresh fruit and vegetables. This dog food is especially good for dogs with joint disorders, as it contains high levels of the nutrients glucosamine and chondroitin, which promote joint and cartilage health. 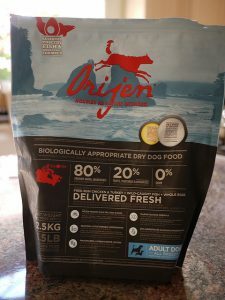 While Orijen is much more expensive compared to the other dog foods on this list, it does seem that you have to feed your dog less of this food compared to others. This means it can last longer than some lower-quality dog foods. Wellness CORE is a line of high-protein, grain-free dog food from the brand Wellness. 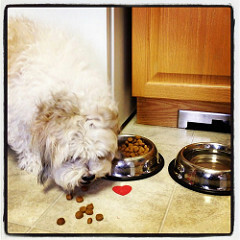 Wellness is dedicated to providing your pet with all-natural, wholesome, and delicious food. This particular dog food has an impressive dry matter protein reading of 34% from good-quality sources, turkey and chicken. It also contains a range of fruit and vegetables for a good balance of nutrients. Plus, salmon oil and flaxseed make it rich in omega 3, which is great for your dog’s skin and coat health. If your dog goes on this food, the dog groomer will be impressed on your next visit! There are small amounts of joint-supporting nutrients in this food, too. So, if your dog is prone to hip dysplasia or arthritis, this food is a great option. This product isn’t the cheapest one out there, but if you can afford it, it’s worth it. Blue Buffalo is a premium brand of dog food that prides itself on formulating foods free from by-product meals, fillers, and all the artificial nastiness. Instead, they pack their foods full of antioxidants and high-quality protein. And all this at a very reasonable price! This Blue Buffalo Life Protection dog food is antioxidant-rich to keep your dog’s immune system healthy and powering on through the years. It includes LifeSource Bits, which are small kibbles that contain a potent blend of antioxidants, vitamins, and minerals from 7 different kinds of fruit and vegetables. This formula contains a dry matter protein reading of 27%, which comes mainly from deboned chicken and chicken meal. While the term “chicken meal” may sound a little dubious, chicken meal actually contains four times more protein than the whole meat. That’s a whole lotta nutritious protein for your dog! While this recipe is not grain-free, Blue Buffalo uses only easily digestible whole grains like brown rice and barley, which are also high in fiber and vitamins. Diamond Naturals is a very affordable probiotic- and superfood-enhanced line from pet food producer Diamond. The high levels of probiotics make it a great choice for dogs with digestive issues. This formula contains mouth-watering, pasture-raised beef in the form of beef meal, a meat concentrate which contains a whopping 300% more protein than fresh beef. Plus, there is a wealth of antioxidants from a range of fruit and veg, making it a superfood fest for your dog’s immune system. There is also a good helping of flaxseed in this recipe to keep the shine to your dog’s coat. So there you have it! Whether you are a new dog owner or you are changing over from your current brand, if you are struggling to decide which dog food is best for your dog, these are 5 great options to choose from.